According to the Chainalysis research, compared to last year, in the first half of 2018, bitcoin became much less used to pay for goods or services. The volume of trading bitcoins, which are used as a payment tool, in May 2018 was reduced to $60 million, although in September last year this figure exceeded $411 million. The coin was much less used at a time when its price dropped from $20,000 to $6,000. 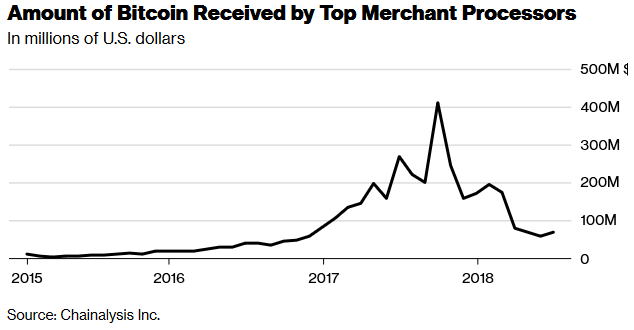 In June 2018, the number of bitcoins that went through payment systems BitPay, Coinfy, GoCoin and others was $69 million. Last summer, users paid the first cryptocurrency almost three times more often – the trading volume was $270 million.